A "bonus" line can occur very soon. The soonest is probably after 7 moves, as it is in the image with the diagonal line X-5-6-X-7. If the player uses this "bonus" line, then he can place his "bonus" dot number 8 where he wants. But he is not forced to use this bonus: he can classically play his move 8, for example 5-6-X-7-8, or elsewhere with another line. This interesting variant was proposed by Roland Lerouxel, a reader of Science & Vie, in a letter to Pierre Berloquin sent in April 1974 with a grid of 160 moves. This variant was named "MS2" (Morpion Solitaire 2) by Berloquin in his column of June 1974. But this variant is older: for example Richard Cotté tells me that he played this variant (and also the classical 5T game) in 1970, when he was a pupil at Lycée Lakanal, Sceaux, France. And Michel Broca also played too this variant when he was a pupil in 1969/70/71 in Paris, finding an excellent grid of 206 moves unfortunately never published, but revealed in this page. Alain Marguier, Terminale C, Valentigney... now, I don't know! Michel Broca, Mathématiques Supérieures, Lycée Henri IV, Paris, then Mathématiques Spéciales, Lycée Janson de Sailly, Paris... now, see below! Marc Bertin, law student, Metz... now, see below! 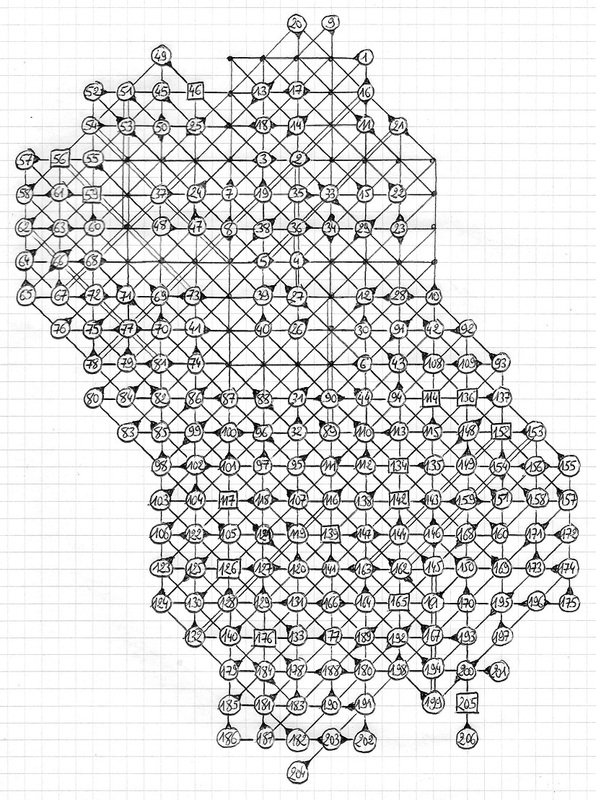 Bertin's grid of 216 moves constructed in 1974: still the current record! 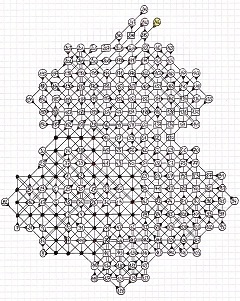 In 1974, a student named Marc Bertin created different 5T+ grids: 190, then 193, then 197, then an extraordinary grid of 216 moves which is still the current world record! Marc Bertin lives now at Vanves, in the south suburb of Paris, and works at France Telecom where he is network architecture planning manager. He likes games, such as chess and card games, and tries to elucidate the philosopher's stone. He remembers having created his record grid trying to find an optimal final geometric configuration. In the middle, publication of Daubié's grid of 162 moves which was at that time the 5T (MS1) record. Is it possible to improve Bertin's record? Because Marc Bertin says that he was trying to find an optimal geometric configuration, here is a grid inspired by the beginning of his game, but symmetrizing the two sides. It is a "correct" final 5T+ grid, and also 5T, because it has the same number of lines of five dots as the number of dots minus 36 (the initial cross having 36 dots)... but it is probably not playable. This grid has 253 moves: you can check that it has 66 horizontal + 65 vertical + 61 diagonal/ + 61 diagonal\ = 253 lines, and 253 + 36 = 289 dots. ... but probably not playable. And it is possible again to improve the number of moves: see a "correct" final 5T/5T+ grid of 317 moves, more than one hundred more moves that Bertin's record! Maybe somebody will be able to use these grids, part of them or a modified part, and obtain a playable 5T+ grid of more than 216 moves? This could beat Bertin's record! We can also imagine a new "5T++" variant, the above final grids of 253 and 317 moves becoming playable. When the game is stopped by there being no more dot and line possible, we have the right to borrow dots, but with the obligation to refund these dots before the end of the game. Then of course the shape and the place of the 36 initial dots have no more impact. This variant was named "MS2 bis" in Science & Vie, but no record grid or score was given. 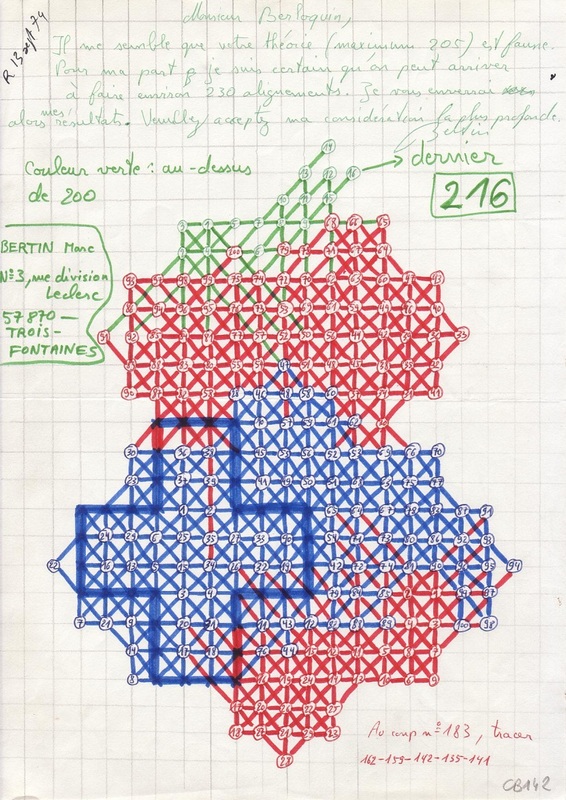 An astonishing MS2 score of 250 moves by Robert Féron was briefly mentionned in the November 1975 issue, but Féron's grid found again in Berloquin's archives is not correct, neither MS2 nor MS2 bis: its numbers of dots and lines do not match. Today, the 5T++ record is my grid of 317 moves. The previous 5T+ record grids of 1974 were never given in Science & Vie, only the scores of Lerouxel and Marguier were mentionned. Thanks to Berloquin's archives, I am pleased to publish them for the first time. A few years before the three grids above, Michel Broca found a better grid, when he was a young student in Paris, in 1969, 70 or 71, as mentioned at the top of this page. But unfortunately his result was never published: he learnt only by reading my website that in 1974 Science & Vie had published articles on this game... He kindly sent me his old grid in January 2012. After the Ecole Poytechnique (1971), Michel Broca worked for ten years in IT consulting, then at Générale des Eaux which is now Veolia Eau, in computing and consumer management. He likes genelaogy, and card games such as bridge and barbu. These two interesting 5T+ grids below were constructed in 2004 and 2010, before the creation of this webpage in 2011. So, their authors did not know the old French records of 1974 revealed above. In Poland, Morpion Solitaire is named "Kreski" or "Krechy" (two words meaning "lines"). Krzysztof Lorys, currently professor at University of Wroclaw, proposed this 5T+ variant in 2000, during the Polish Olympiads of Informatics. People continued to play after the Olympiads, and the best grids obtained were 197 moves in 2002, then 199 moves in 2004, both created by Zbigniew Galias. There is an applet playing at 5T+ directly in your internet browser, written by K. Lorys. Click three times for each move: 1) on the added dot, 2) on the beginning of the line, 3) and on the end of the line. If you want to cancel your previous move, click on "Cofnij". If you want to start a new game, click on "Nowa gra". Using Lineapolis and its "Bonus mode" equivalent to 5T+, software created by Dariusz Gierlotka (also Poland), Jean-Luc Coursel (France) obtained the record of 209 moves on his PocketPC. An excellent score! 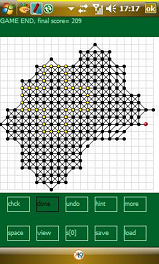 Coursel's grid as displayed by Lineapolis, but image slightly modified with the 36 dots of the initial cross colored in yellow.